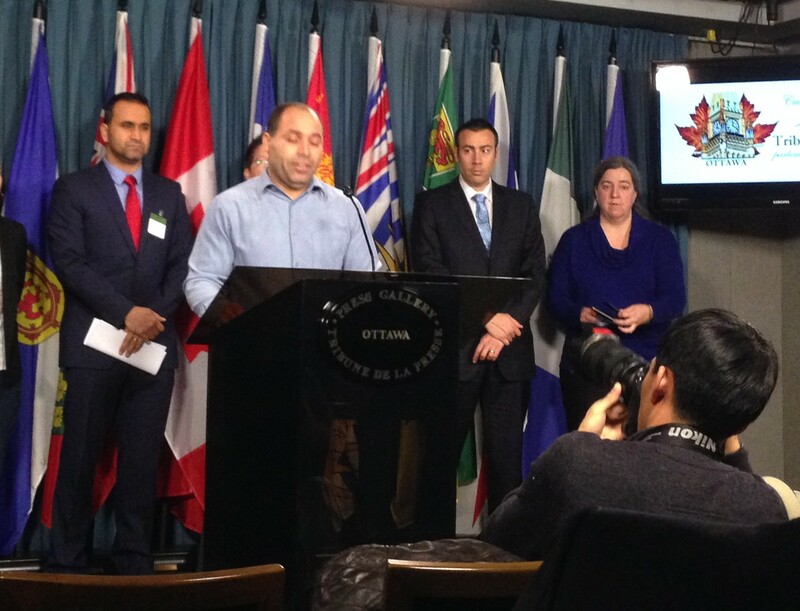 The ICLMG read the following statement today at a press conference on Parliament Hill alongside Mohamed Harkat and his lawyer, the Justice for Mohamed Harkat collective, and two of our member organizations, Amnesty International and the National Council of Canadian Muslims. Last August 2015, the federal government launched deportation proceedings against Mohamed Harkat, exactly 20 years after he first arrived to Canada and claimed the refugee status. Mohamed Harkat was arrested on December 10, 2002 – exactly 13 years ago – under a security certificate, and since he has been in a legal limbo. He stayed three years in jail, some of them in Guantanamo North, the 3.2 million dollar prison built specially for Muslim detainees. After he was released, he was subjected to the strictest conditions of house arrest. His wife, Sophie Lamarche, became his “unofficial” jailer at home, thus losing what remained of their privacy. For many years, he had to wear an electronic tracking bracelet to monitor all his movements. In May 2014, the Supreme Court of Canada upheld the government security certificate regime and found that the security certificate against Mohamed Harkat was reasonable. However, the Supreme Court reminded the judges operating under the Immigration and Refugee Protection Act that they should be “interventionist”, and clearly stated that the government couldn’t proceed with a security certificate case unless the suspect is reasonably informed of the case against them to ensure their defence. Unfortunately, today, we haven’t seen any steps taken by the government towards allowing suspects to access the secret evidence, if any, against them. On the contrary, Bill C-51, the Anti-Terrorism Act passed in June 2015, reinforced the use of secrecy even in the cases involving Canadian citizens and has lowered the threshold and expanded the grounds for preventative arrest. This deportation decision would be the first step towards the removal of Mohamed Harkat from his peaceful life in Canada to torture and very likely disappearance and execution. 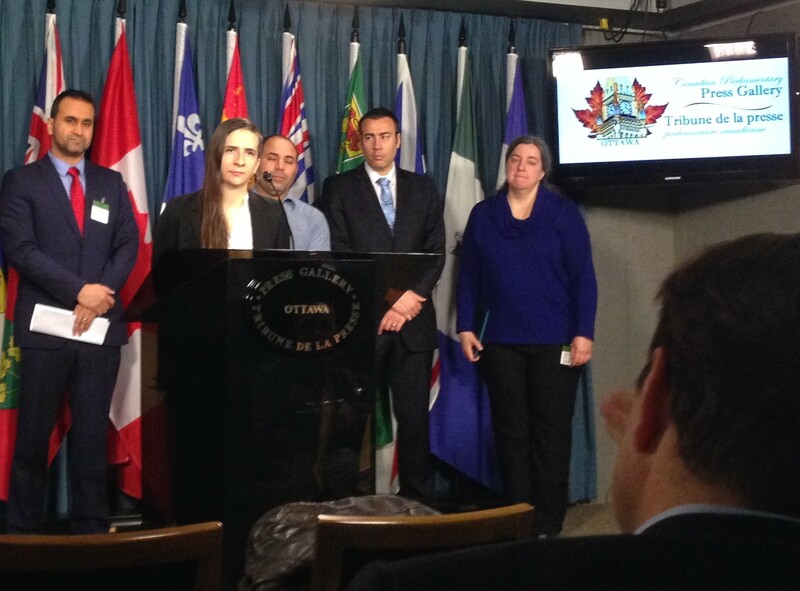 Before being sent to torture, an assessment of the potential danger to Canadians posed by Harkat needs to be done. But realistically, what is the threat posed today by Mohamed Harkat? The Supreme Court has ruled in the past that terror suspects can only be deported in “exceptional circumstances” to countries where they face a substantial risk of torture, but it has not defined the full meaning of that concept. According to many human right organizations, like Amnesty International and Human Rights Watch, Algeria is still considered to be a country where grave violations of human rights are common. Can Canada really accept in good conscience the diplomatic assurances that would be given to deport Mohamed Harkat to Algeria? We do not believe it can. Today, we ask the Minister of Public Safety and Emergency Preparedness, the Honourable Ralph Goodale, to immediately stop the deportation procedures against Mohamed Harkat. And we add: does this government want to be remembered for sending a refugee back to torture or execution? ICLMG believes that Mohamed Harkat should be allowed to stay in Canada with his wife. After more than a decade of legal fights, secrecy, physical and emotional distress, it is time to give Mohamed his rights and his life back. This entry was posted in News from ICLMG on 10 December 2015 by ICLMG CSILC.